Wiggly rulers don’t seem like good measuring devices, but Velocity-induced Acoustic Oscillations might be an exception. Planets are occasionally found swallowed by their dying host stars. Where and how often does this happen? Radiation from massive stars can melt away protoplanetary disks. What can the leftover disks tell us about the environment from which they formed? How, and when does the wavelength dependence of photospheric radius of an eclipsing exoplanet become too important to neglect? The sites of planet formation seem to be anything but orderly and a recent discovery may help explain the observed wide variety of exoplanet configurations. The Milky Way’s nearest neighbor, the Andromeda galaxy, is a promising target for deep multi-wavelength observations. 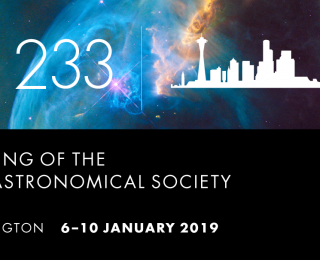 Come listen to Prof. Julianne Dalcanton talk about her work catching up with the neighbor at #AAS233! Some galaxies are easy to find—others, like dusty galaxies with extreme star formation, are a bit harder to track down. Come to Professor Caitlin Casey’s #AAS233 talk to learn how we can find these galaxies in the “obscured early universe”! Astrobites is a daily literature journal summarizing new astrophysical research posted to astro-ph. Astrobites is written by graduate students for undergraduates. Read more about our goals. T-shirts, hats and more available here.